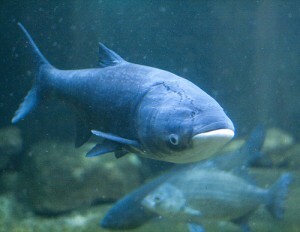 A new study released in April finds Asian carp may in fact be reaching the Great Lakes. The Asian carp is an invasive species with an appetite large enough to potentially decimate the food chain ecosystem of the Great Lakes. There have been many efforts to contain the spread of the fish in the Chicago Area Waterway System to connects to Lake Michigan. The study now raises new questions about the effectiveness of that system. Current State’s Mark Bashore talks with study co-author Dr. Andrew Mahon, assistant professor of biology at Central Michigan University, and Dr. Tammy Newcomb, senior water policy advisor for the Michigan Department of Natural Resources. I have no speakers so I can’t listen to what they said on the show. However I have followed the barrier history, and been to several meetings. There is no doubt in my mind Asian Carp are in the lakes, and we’re just waiting for them to pull off a spawn. From the beginning they said 4 volts were required to stop all sizes of Asian Carp, and even at that when scared they can blow right thru. But sparking wont allow 4 volts. Since they don’t bite a hook, it will take several or dumb luck before someone catches one, snagged or whatever. All invasives start out with just a few, according to experts how many predators or “biotic-resistance” they run into or “invasive friendly” if you will determine if they thrive or not. The first shad was found in Muskegon Lake in 1953, came out of the Chicago river, just one. How many we got now? Only thing keeping shad knock down is cold weather, or overpopulation. They eat the same as Asian Carp roughly but the Asian Carp ain’t alergic to the cold. Not hard to see what’s going to happen.